This is the suggested layout for your Tapestry project; it is the layout of folders and files created by the Tapestry Quickstart Archetype. If you are creating your own build using Ant, you may use whatever conventions work for you ... as long as everything gets packaged up into the right place in the target WAR. Parts of this project layout mimics the format of an exploded WAR (a WAR file unpackaged onto the file system). This will often enable you to run your application directly from your workspace, without any special build or packaging process, while developing. Each of the major IDEs has plugins to allow you to accomplish this task ... and it's one of the factors (combined with live class reloading) that makes working with Tapestry a breeze. Compiled Java classes will ultimately be packaged in the WAR inside the WEB-INF/classes folder. Resource files are under src/main/resources. This includes the message catalog for the Index page (Index.properties), as well as the message catalog and component template for the Layout component (Layout.tml). These files will also be packaged into the WEB-INF/classes folder of the WAR. 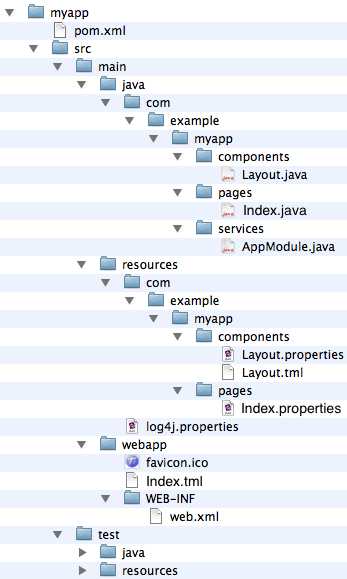 Component templates will always be stored in the resources folder. Templates for pages may be packaged in the WAR proper instead. The WAR is built primarily from the src/main/webapp folder; this is where ordinary files are stored (such as images and stylesheets). Page templates may also be stored here (Index.tml). The file src/main/webapp/WEB-INF/web.xml is the servlet container deployment descriptor, which has a very specific configuration for Tapestry. The build tool (usually Maven) will be responsible for putting compiled classes and resources into the WEB-INF/classes folder of the WAR, and for putting the Tapestry library, and its dependencies (as well as any additional libraries defined by your application) into the WEB-INF/lib folder. The folders src/test/java and src/test/resources are used when compiling and executing tests. Files in these folders are not packaged into the final WAR.